3 Foot Crowbar: Estimates of Aegerion’s addressable market at odds by 1,000%. Estimates of Aegerion’s addressable market at odds by 1,000%. 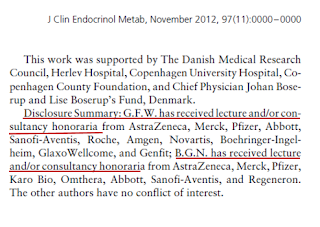 With Aegerion’s decision to stop revealing patient counts, we have only underlined an older suspicion: the estimate of HoFH patients in the USA as used by the very scientists associated with Aegerion may be correct and consequently, the actual U.S. HoFH patient count promoted by the CEO would be a 1,000% exaggeration … 90% lower than Aegerion’s promotional material suggests. Dr. Marina Cuchel, top listed scientist on Aegerion’s phase 3 study for Lomitapide. DR. Daniel J. Rader, “the inventor of the patent." The CEO says that he believes there might be 3,000; whereas scientists associated with Aegerion have used numbers which amount to only 300. 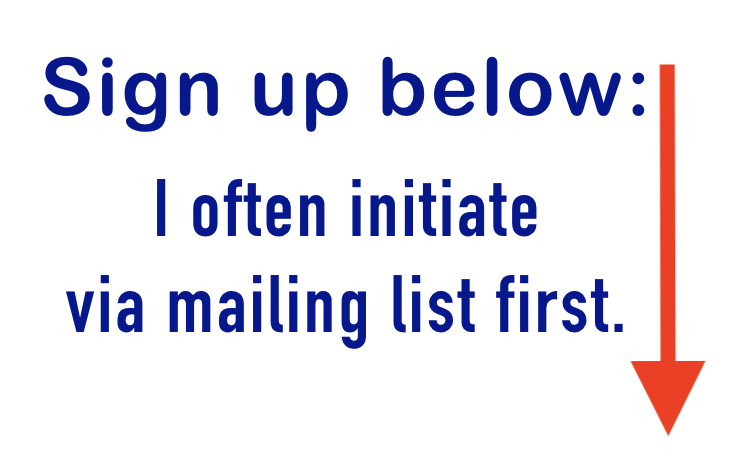 Marc Beer, CEO of Aegerion uses “3,000” which would be a prevalence of 1:100,000. 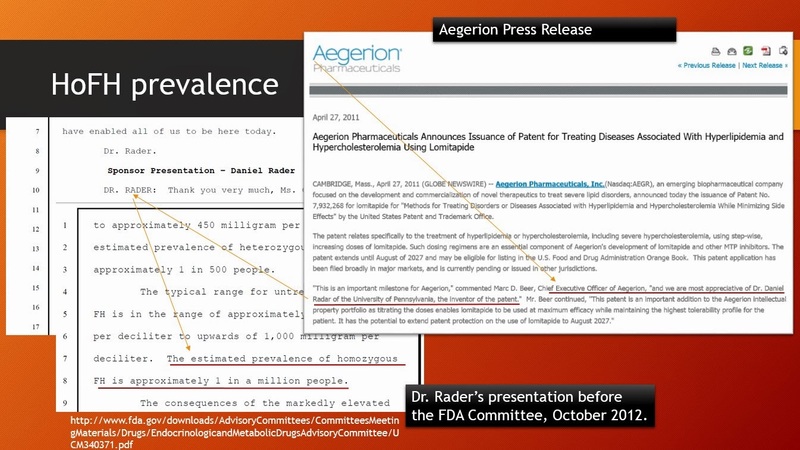 "... there may be as many as 15,000 potential patients appropriate for lomitapide therapy in total on a global basis, with at least 3,000 of them being in the U.S."
DR. Daniel J. Rader, introduced by Aegerion as “the inventor of the patent," uses a prevalence of “1:1,000,000,” which comes out to about 300 patients in the USA. 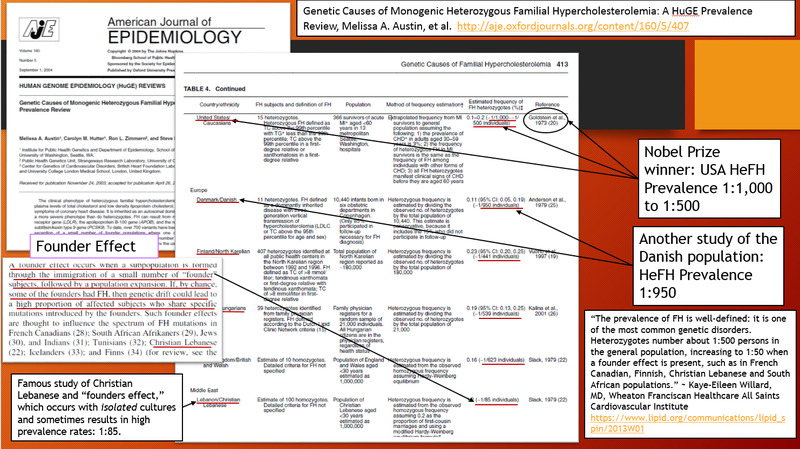 "The estimated prevalence of homozygous FH is approximately 1 in a million people." To see the relationship between AEGR and Dr. Rader, see Aegerion press release at http://ir.aegerion.com/releasedetail.cfm?ReleaseID=572091. Aegerion financially supported a study on the prevalence of HoFH in Germany and that study estimated a prevalence of 1:860,000. As of this writing, the U.S. population is about 317 million. Even if this higher prevalence rate were representative of U.S. rates, these numbers would still estimate the U.S. population of HOFH patients to be somewhere between 300 and 400. That’s a serious drop from Aegerion’s promotion of 3,000. Perhaps it’s possible that those with a Wall Street interest in prevalence rates know more than the scientific community, or perhaps some people just get high by smoking their own math. Me, I think I’ll bet on what the scientists are saying. But investors currently value Aegerion at a 2 billion dollar market cap, about $70 - $80 per share -- as if all of this has already happened and as if there were no issue of an exaggerated patient count. If the generally accepted prevalence rate ends up being correct and if the market adjusts revenue estimates down 90%, what stock price will we adjust to? Wouldn’t that pull the rug out from under a $2 billion dollar fantasy? 90% down from here would be about $7 or $8 per share. That’s a serious drop. "We had nothing to do actually with this publication." This is clearly not the case. One only needs to scroll down to page 12 to see that Aegerion put up some money here. The fact that the study focused on HeFH and not HoFH is not a concern, since HoFH is a subset of HeFH. “HeFH” refers to Heterozygous FH (inherited from only one parent) and HoFH, to Homozygous FH (inherited from both parents). 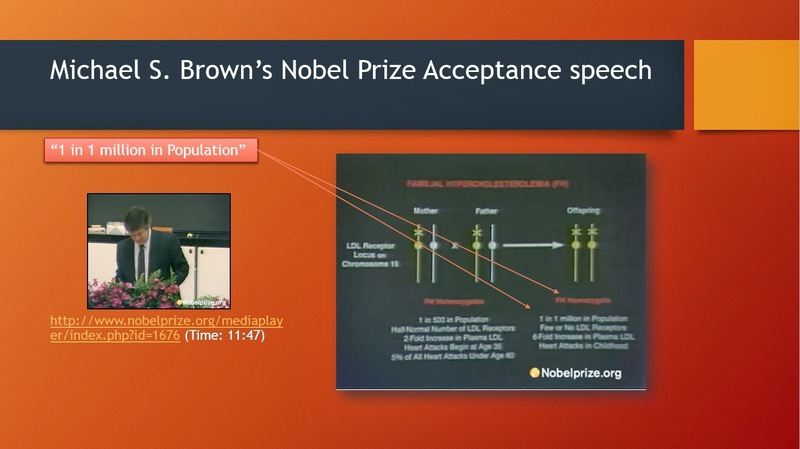 So when the study challenges the widely accepted HeFH prevalence of 1:500 with the new number 1:200, we should accept that, if true and representative of the general population, this would have a bearing on HoFH prevalence rates. So far, so good. 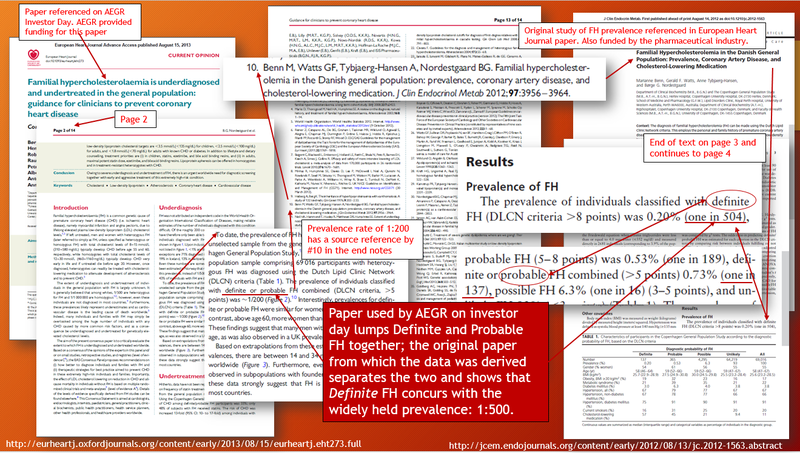 But why would Aegerion use the paper from the European Heart Journal and not use the original paper from which the European Heart Journal derived the information, lumping “Definite” FH patients together with “Probable” FH patients. When we read the text we learn that the paper is recommending a scoring system which will categorize candidates for FH according degrees of probability. Now we have several categories from which we can lump “Definite” and “Probable” FH patients together and find a higher prevalence rate. In the original paper you can also see these scores shown separately, and, surprise, surprise, the prevalence for Definite FH is the same old 1:500. The European Heart Journal shows them lumped together and naturally we are shown a higher prevalence rate. 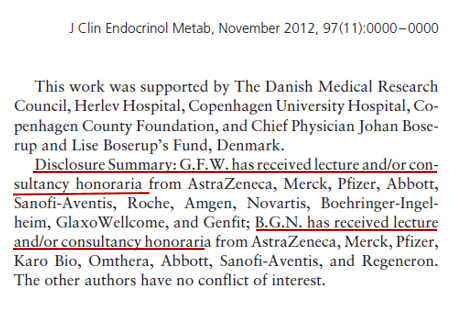 And do we really have a right to make assumptions on the U.S. population of HoFH patients from this particular study? There are several problems inherent in such an attempt. a typical country in Northern Europe.”11 and that it is contradicted by a previous study of 10,000 Danish infants which estimated an HeFH prevalence of 1:995. There is a serious gap of several hundred percent between two different studies, both estimating Danish prevalence rates for HeFH. 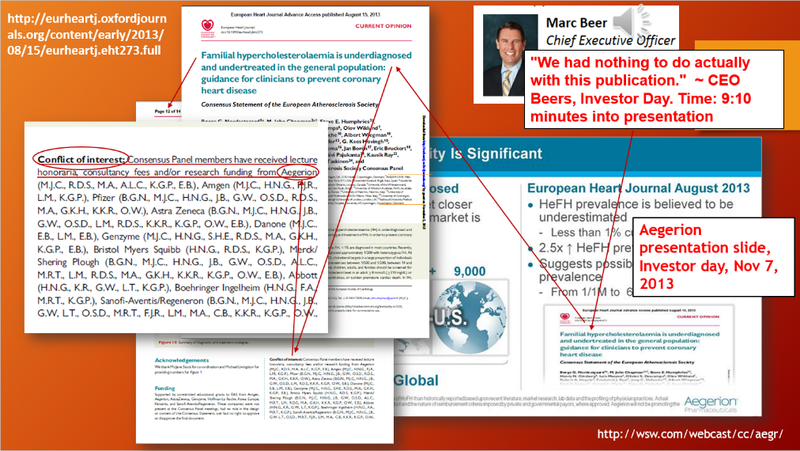 Another study which Aegerion did not mention is one which it also funded and which determined an HoFH prevalence rate in neighboring Germany of 1:860,000. In fact, many studies have been done by others regarding the prevalence rates for HeFH and HoFH. So we’re not without a sample of prevalence counts, none of which should be taken off the table. A study in the UK put the prevalence of HeFH at 1:623; in Japan, at 1:900. In the illustration below, note that the numbers for the USA were derived from a Nobel Prize winner’s research, Joseph L. Goldstein, and were estimated to be in a range of 1:500 and 1:1000.